These Ukrainian Easter Eggs (Pysanky) were decorated by my Great-Aunt and her children, in Queens, New York, over 80 years ago. 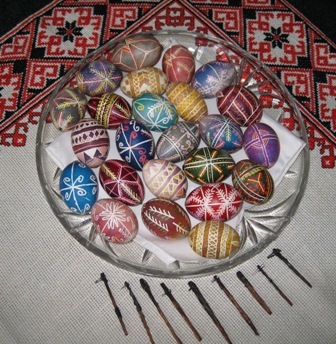 The “sticks” displayed in front of the platter, are home made styluses (kistkas), used for outlining, with wax, the design on these eggs. These styluses’ handles were made from tree twigs, and the metal funnels were made from a metal can cut outs, or straight pins pushed through the tips of the handles…..such was life 70 years ago. Her love of art and tradition, was passed down to yet another generation, and another, and another, and still going…….Some of the dyes they used for coloring these eggs, where purchased in powder form, but other ones were created at home, by cooking red beets, onion skins, tree bark, etc. I commend her children for preserving these Easter Eggs for all these years, and I am honored to be the recipient of this family heirloom. I promised to continue to preserve these, and to share the story about the beginning of our family roots in the US since early 1900’s. Here I have displayed the 80 years old home made styluses, in comparison to the two manufactured ones, used currently by most egg designers. Professional egg designers prefer to use the electric styluses with various size tips, ranging from very fine tips, used for the very fine lines of the design, to very large size tips, used for a large area to be filled with melted wax. If you are interested in purchasing Egg Design books, or some very unique Easter Eggs, you can find them here. Here you will be able to find Ukrainian Easter Egg decorating kits and other supplies. Wow, what wonderful heirlooms you have. I would be too scared to store them, unless they were individually packaged perhaps in their own boxes. Thanks for sharing your traditions. You must be extremely organized to keep it all going. You are a great writer, keep it up. These eggs have lots of sentimental value to me. They are easy to store since I have individual stands for them, and they are only shells now, so no need to worry about messy cracks. Thank you for your comments Suzy, I also enjoy visiting your site. Pysanky Ukrainian egg decorating was handed down to me through my mother. It’s a wonderful hobby and past-time. I even create them for the Christmas Holidays. 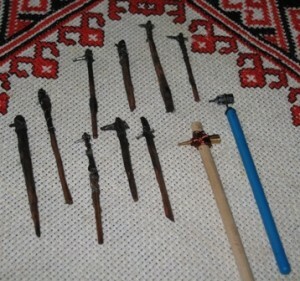 It is so wonderful to hear that your mom taught you such a beautiful Ukrainian cultural craft/hobby. I agree with you that you can’t stop on just one. It totally grows on you and draws you in like a magnet. So, you make them as Christmas gifts for family and friends, or you just make them with Christmas theme, for yourself? You must be a busy lady making them practically whole year round. Thanks for stopping by my blog and leaving me a comment. I just read all your posts about making Ukrainian Easter eggs. I’m so impressed that you have some that were made 80 years ago – they are beautiful. It is interesting to see the home-made styluses. I didn’t realize you could get electric ones with different sizes. We used store-bought ones, but they were not electric. I must say it is very difficult to get a thin straight line so I’m always so impressed by some of the intricate ones you can buy. I also did not realize that the traditional colours were black, red, orange, and was it yellow? We used any colour when we were doing ours. Thanks for all the details – I enjoyed the posts. Thank you so much for stopping by and taking the time to read my Pysanky posts, plus leaving such a nice comment. I am looking forward to doing Pysanky again, once my granddaughter gets a little older….she’s just four years old now…..she’ll be ready in a couple of years.